Are you ready to walk in the middle of postcard-like scenario? In the first part of this journey you will walk along the legendary strade bianche ("white roads", dirt roads) of Siena for kilometres and kilometres, crossing the Val d’Arbia and the Val d’Orcia, icons of the Tuscan landscape. You will visit wonderful villages like Bagno Vignoni, with its enormous thermal pool in the centre of the square, and Radicofani, whose fortress dominates southern Tuscany. Once you enter Lazio, you will be amazed by the beauty of Lake Bolsena, and charmed by the ancient paving stones of the Via Cassia, still intact after 2000 years, before visiting the charming old town centre of Viterbo. You will cross the vineyards of the Brunello di Montalcino, one of the best Italian wines, and the production zones of the cacio di Pienza (type of cheese), before entering one of the most important areas for the production of extra-virgin olive oil, between Bolsena and Montefiascone. Walk barefoot on the paving of the Via Cassia in Montefiascone. 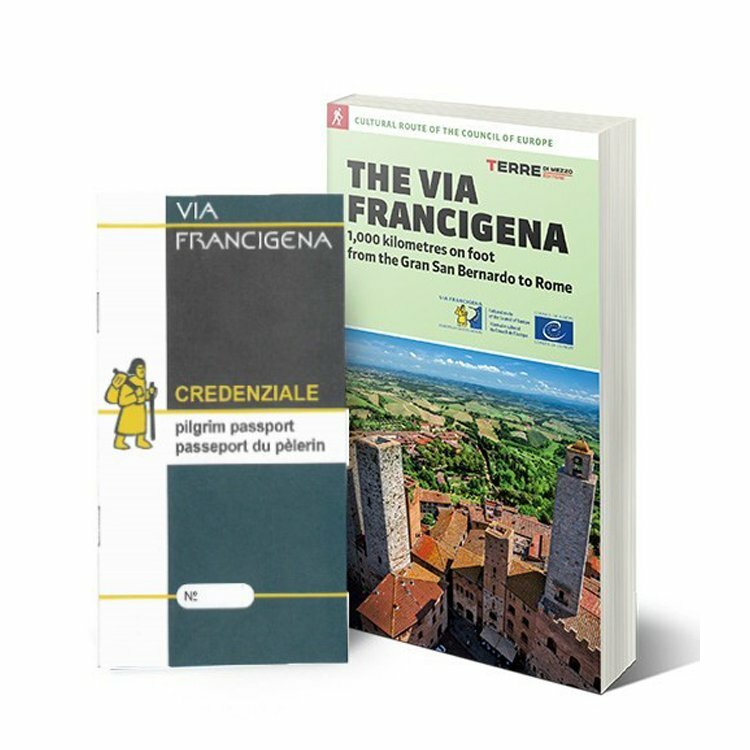 Your journey will start in Siena, one of the most beautiful towns along the Francigena, famous for its palio: you will be able to spend the day walking through its paved streets, looking for coats-of-arms on the walls of the contrade, or climbing the Torre del Mangia to enjoy a unique view over the roofs of the town; not to be missed is a visit of the duomo, which will impress you with its amazing black and white columns. If you are lucky you will be able to witness a festival in one of the contradas, and see the work of the skilled flag-throwers, before sitting down at a table in Piazza del Campo to enjoy a plate of pici all'aglione for dinner, admiring the illuminated Palazzo Pubblico. Let’s hope that the sun will be shining during the first day of your journey, because the Crests of the Val d'Arbia offer unforgettable views: after saying goodbye to Siena, resting on the hills on the horizon, you will travel along the typical dirt roads of Siena as far as the fortified village of Lucignano, with its fine church. At the gates of Monteroni d'Arbia you will be able to admire the impressive Grancia di Cuna, a fortified farm which once held the reserves of wheat destined to the Republic of Siena. From Lucignano you will continue your journey through the Valle dell'Ombrone to Buonconvento. You will cross the gate of the walls and enter the fine old town centre of the village, discovering why its name means "happy fortunate place": you will walk through the picturesque streets, where life is lived quietly following the slow rhythms of a countryside village, and if you love art, you will have the chance to admire the works of some of the most famous Sienese painters in the Museum of Sacred Art of the Val d'Arbia. Today your journey will take you towards San Quirico, over dirt roads and some asphalted ones: these, however, will be compensated by the beautiful views of the Val D'Orcia, among hills tinted with charming shades and scattered with vineyards and cypress trees. In San Quirico you will stand enchanted before the gate of the Collegiata, trying to recognise the various architectural styles that blend into its decorations, before enjoying a rest among the green hedges of the Horti Leonini, a fifteenth-century garden. You will continue your journey across the fabulous views of the Val D'Orcia: just beyond San Quirico you will enter a timeless world visiting Vignoni Alto, and you will be able to enjoy a reinvigorating rest in the thermal waters of Bagno Vignoni, with its unmistakable pool in the middle of the main square. The other pearl of the day is Castiglione, in the heart of the Val d'Orcia, which you will pass close by as you travel across one of the most beautiful panoramic sections of the whole Via Francigena. Today you will test your strength with a short but demanding leg of your journey which will take you as far as Radicofani: but it will be worth it, because admiring the view from the Radicofani fortress, tired but satisfied, will repay all your efforts. You will also be able to visit the Pieve di San Pietro, a little jewel dating back to the thirteenth century, and take an evening walk in its old town centre, admiring the magic of the illuminated Fortress. 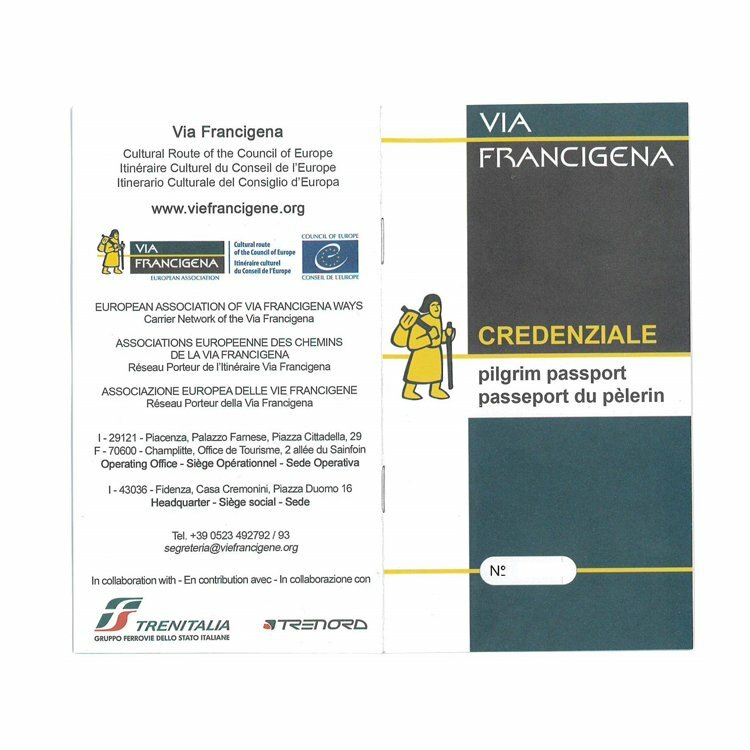 From Radicofani you will walk towards one of the most exciting sections of the Via Francigena, leaving the fortress behind you and travelling along the old Via Cassia, surrounded by scenery of infinite hills dominated by Monte Amiata. Through the valley bottom of the Val di Paglia and following the route of the Cassia nuova you will climb for the last time before reaching Acquapendente, the northernmost municipality of Lazio. You will pass through the Porta della Ripa before entering its old town centre. You will be able to walk in silence in the Romanesque crypt beneath the Basilica del Santo Sepolcro, among decorated capitals and arches. According to tradition, some stones bathed in the blood of Christ are supposed to be kept here. If you feel like this stage may be too long for you to walk, don't worry: you can make it shorter with brief stretches by public transportation. Your journey will continue gently as far as the first views of Lake Bolsena: from here you will descend into a volcanic crater and you will continue along dirt tracks, alternating thick woods with meadows scattered with olive trees, before reaching Bolsena. If you are curious to see proof of the miracle of the Corpus Domini, for which Bolsena is famous, in the Cappella del Miracolo some marble slabs stained by the blood pouring from a Host in the thirteen century are kept. If, instead, you are more interested in the typical cuisine. you can taste the products offered by the lake, such as the Sbroscia, a local soup made from lake fish and tomatoes. You will continue through woods and olive groves, on a route that will offer constant views of the lake: you will cross an area famous for the production of Extra virgin olive oil, which we recommend you taste on the a piece of fragrant local bread, before arriving in Montefiascone: not to be missed, a climp up to the Rocca, where you will be enchanted before a boundless views. After descending from the Rocca, you can go into a typical wine bar and taste a glass of the famous Est!Est!!Est!! !, which here tastes even better because it is produced locally. We return to travelling along the ancient paved road of the Via Cassia, in a leg of our journey that takes us over hills dotted with charming views over Montefiascone and Viterbo; you will be able to enjoy a pleasant stop at the spa of Bagnaccio, recharging your batteries in its thermal waters before proceeding towards Viterbo, the end of your journey. To honour of our trip, do not miss visiting the pictoresque pilgrim’s quarter, before admiring the splendid Palazzo dei Papi and enjoying the silence of the Longobard cloisters of Santa Maria Nuova. And to end on a sweet note, celebrate the end of the journey with the delicious local frittellacce! The three-star Hotel Chiusarelli is located in the city centre of Siena, finds its natural setting in a neoclassical villa built around 1870. The structure has been completely renovated in 2013. Rooms are spacious and clean and these offer bathroom with shower or bathtub, hairdryer, air conditioning/heater, telephone, Wi-Fi, TV with Sky Vision. The Hotel has no lift. High quality breakfast. Hotel Il Ghibellino*** is located in a strategic position near Crete Senesi and Val D'Orcia Park. Rooms are spacious with free Wifi, TV, air conditioned, telephone. Breakfast is basic. Set in the city centre of San Quirico d’Orcia, Affittacamere l'Orcia is a few steps from the Horti Leonini gardens. Rooms have free Wifi, heating (no air conditioned), TV and elegant furniture. Staff aren't present in the structure, but You can advise them by phone. Breakfast is good. Il Vecchietta is a restored stone house, set in the historic centre of Castiglione d'Orcia that offers a garden with BBQ facilities and features rustic-style rooms with exposed wood-beamed ceilings. Featuring mountain views, rooms are a little bit old-fashioned but they are comfortable and clean. The owner is helpful and friendly. Set between 2 rolling hills in the heart of the Val D’Orcia Valley, Agriturismo Selvella is a renovated Tuscan country house Radicofani 3 km away offering typical rustic rooms and a summer pool. The location is quiet and totally surrounded by nature. Rooms are comfortable and cozy with free Wifi, air conditioned and some of these have a view overlooking tuscany countryside or Radicofani. Owners are hospitable and helpful. Quality breakfast and cuisine. Hotel Toscana is situated in the center of Acquapendente, a few steps away from main sites. Rooms aren't so much large, but well-furnished in a simple way. Cuisine is good and appreciated. This agritourism is just 250 metres from the centre of Bolsena and it has a nice view of the Bolsena Lake. Rooms are spacious and well appointed. These offer flat tv, free WiFi, air conditioning, heating, independent bath and shower and some with private entrances. Breakfast is rich and various of sweet and savoury food. Hotel Urbano V is situated in a very tranquil position, in perfect balance with the architecture of the historical centre. Rooms are well-finished, clean and comfortable. These offer TV satellite, safe, air conditioning, free WiFi. Breakfast is rich and good. From Bologna Airport (BLQ), reach the central railway station, from where you can take a train to Siena with change in Florence. From Pisa Airport (PSA), you can take a train to Siena with change in Pisa Centrale station and in Empoli. From Florence Airport (FLR), take a public bus to Florence Santa Maria Novella Train Station, and then either a bus or a train to Siena (both direct). On departure, you can reach Pisa, Bologna and Florence by train. Train timetables are available on the website www.trenitalia.com. Bus timetables are avavilable on www.busfox.com/timetable (Siena-Firenze).